It is springtime is coming, flowers are blooming and the windmills are turning and that can only mean one thing, another Free-4-All at the Historic Maryhill Loops Road. This is not a competition, just gathering of friends and world class athletes for a weekend of fun and skateboarding the legendary Maryhill Loops Road. Free-4-All is just as it sounds, anything goes. This event is open to all skill levels and any gravity powered vehicle is welcome. Do you like riding in large packs? Then the Free-4-All’s are for you! The pack riding at a Free-4-All is legendary so come and be a part of some of the largest packs anywhere in North America. The entry fee is $140.00 USD. 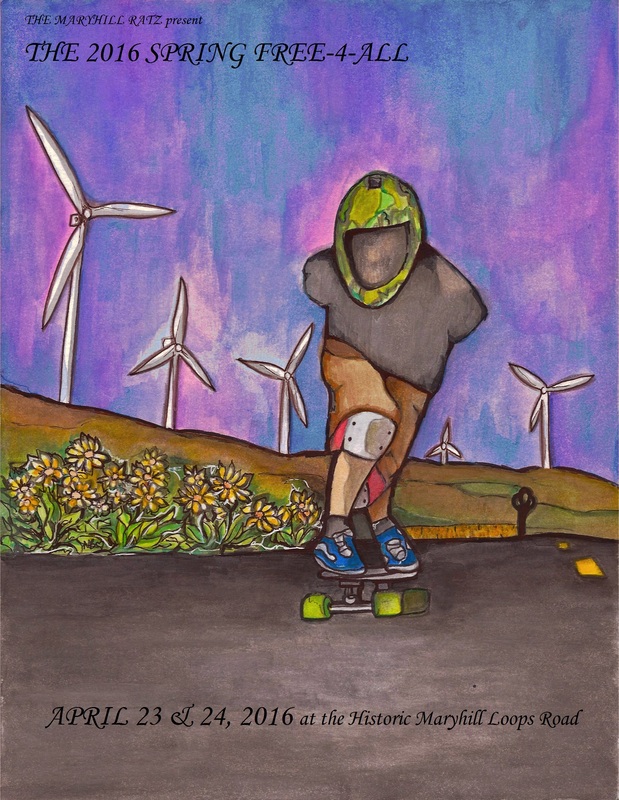 Entry fee includes two days of safely riding the most famous skateboarding hill in the world, a personalized laminated badge and lanyard, a Maryhill Ratz water bottle and lunch each day. Full face helmet, gloves are required and leathers are required but we will offer the “no leather tax” of $20 for the weekend (paid in cash on site as a donation to the Klickitat County EMT’s), which will allow you to ride the hill without leathers.